When we lived in Kentucky, one of the things I liked best about Derby Week was, for lack of a better name, Derby-Pie. When I say lack of a better name, I mean Derby-Pie is a registered trademark of Kern’s Kitchen in Louisville, and Kern’s lawyers are really aggressive about defending the trademark, so around Louisville and Lexington you’ll see menus with “Kentucky pie” or “May-day pie” (because the Derby is always run on the first Saturday in May). 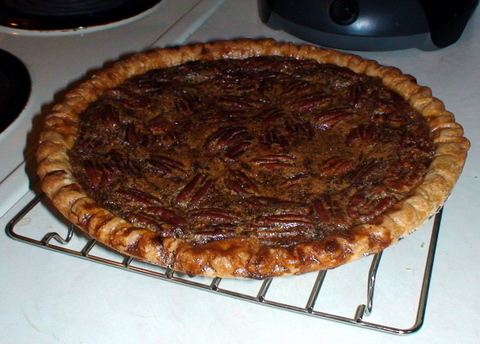 Generically, it’s a chocolate pecan pie with bourbon, but no one in Kentucky calls it that.